Which story will you see? The use of 3D stereoscopic technology in branded content seems to be on the rise. Just last week, we featured an effort by Axe and Ponce Buenos Aires -- a film that touched on a man's dilemma of choosing between the younger woman and the more experienced one. 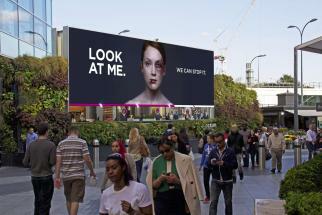 Now, U.K. charity Women's Aid and WCRS put the technology to a more worthwhile use, with "Blind Eye." The cinematic commercial lets viewers "edit" the film as they see fit, by closing either their left or right eye. While the full effect of the movie is probably best seen in the cinema, the behind-the-scenes film, seen here, offers a glimpse of how it would look to viewers. The film tells two concurrently occuring stories: one about a woman going about her evening, and the other a more disturbing one that features the same lady, with an abusive husband. The message is: Will you choose to see the abuse that is happening all around you, or will you just close to your eyes to it?